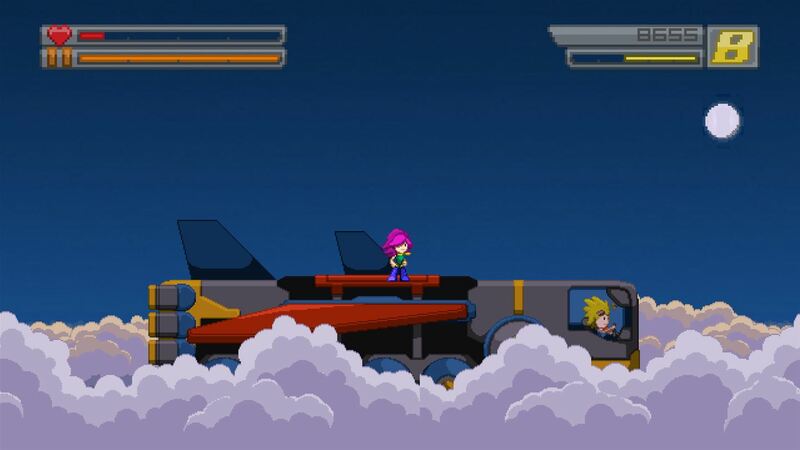 I’ve always been a huge fan of platformers. I’ve not always necessarily been that good at them, but there’s something about the mechanics that just pull me back in for more. Back in August 2017, there was one side-scrolling platformer in particular that came out of nowhere and completely took me by surprise. That game was BLEED. I absolutely loved it, and despite the fact it felt like a keen focus was placed on boss fights rather than the combat between each level, the game was one that I went back to multiple times simply due to how enjoyable it was. Now though, BLEED 2 has arrived and, after successfully becoming the world’s ultimate video-game hero last time out, now is the time to continue Wryn’s adventures. Are we in for another fine adventure though? So, after taking on the most celebrated game heroes on Earth and besting them to prove herself as the greatest videogame hero of all time during her first adventure, our pink haired protagonist Wryn has finally got what she wants. She’s finally become the beloved heroine she dreamed of being. But with many of the Earth’s heroes now gone, and Wryn left to protect the planet alone, the aliens keeping watch have decided that now is the perfect time to invade. It’s down to Wryn to put the heroic skills she possesses to use once more in order to save the world from the deadly alien threat – as well as the advances of a returning foe. 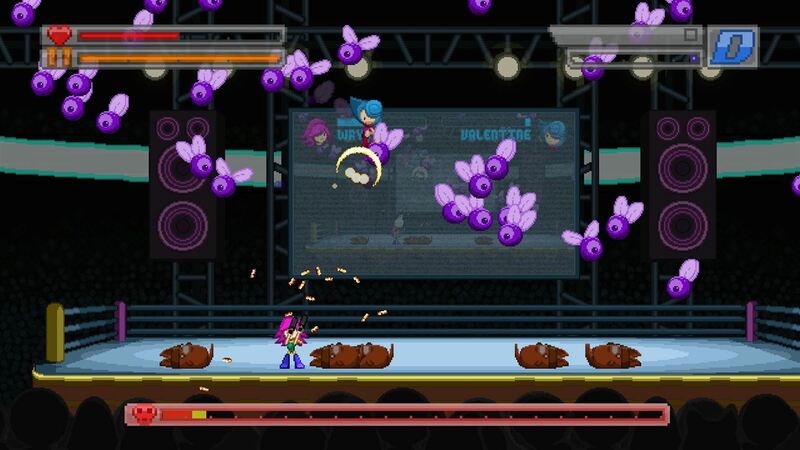 Much like the original, BLEED 2 has a number of different modes for players to get stuck into. The best place to start is with the Story mode, however the Arcade and Challenge options return once more alongside another new mode. The story is largely the same as that seen in Wryn’s original outing. There are once more seven missions to play through, all of which build up to an eventual boss fight to conclude each one. At the start of each mission, a slightly startled news reporter fills you in on the story progress, whilst reminding you that the entire world is resting on your efforts. No pressure then. Fortunately, the controls are simple enough to get on with. The right trigger controls jumping, and this saved my bacon time and time again thanks to the fact that Wryn’s jump can actually be used three times for a triple jump – she’s too badass for a double jump – or a wall jump. These are key to avoiding the majority of enemy fire. Other than that, you have the basic movement via the left stick and firing your weapons which is done via the right stick – with that coming with unlimited ammo. Whilst there are a couple of others, these are the main controls you’ll be using for 99% of the action within the game – at least on the lower difficulties. If you’re aiming a little higher than an easier completion though, then you’ll certainly want to make use of the bullet reflection technique that Wryn can pull off by brandishing her Katana at just the right time, just as pink coloured bullets are about to hit you. Alternatively, Wryn can move through projectiles, jumping when already in mid-air; however pulling this off takes a fair bit of practice. It’s easy to see why it would be a great choice on the hardest difficulties though – at least if you can get to grips with it. None of the missions are an overly long process and, all in all, the whole story can be done inside the hour, even at a casual pace. For those who enjoy the fast-paced run and gun gameplay though, there is plenty of replay value to be had that more than makes up for the short story length. 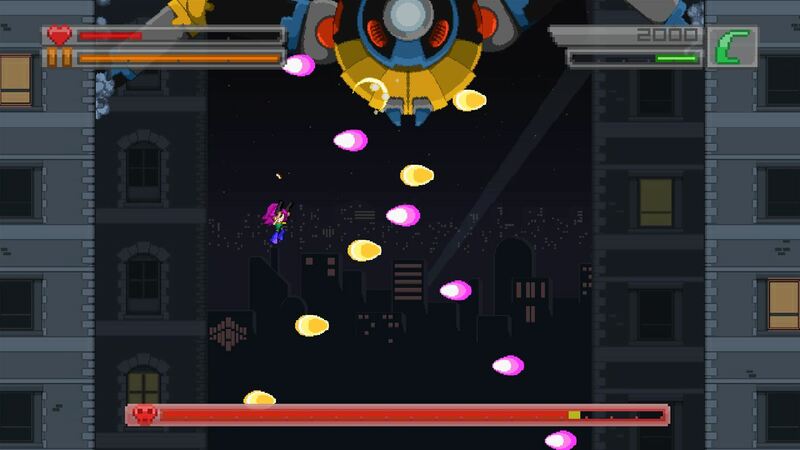 Throughout each mission, players will fight through an array of different, yet basic enemies – many of which return from the original game – and all of which can be killed fairly easily. They only really offer much challenge when they are all firing at you at once or come at you in large numbers, however to get to the end without relying on checkpoints to aid you along, you’ll need to utilise those nimble skills and some lightning quick reactions. 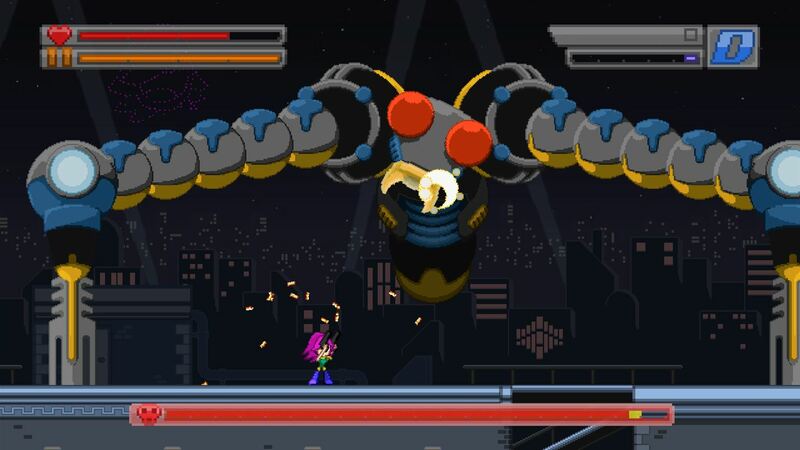 Whilst it may seem rather accessible with its visuals and simple control scheme, BLEED 2 is borderline bullet-hell when it comes to the actual combat, meaning you’ll need to have your eyes fixed to every part of the screen if you don’t want to end up running in to the boss fights with little to no health remaining. There are of course multiple difficulty levels – easy, normal, hard and very hard – with higher difficulties naturally producing much more in the way of enemy fire and presence. In order to even try those you’ll need to master the lower levels first as the difficulty spike is an extremely large one in the BLEED games. Getting the coveted SSS-rank on any particular stage is hard enough on easy, and simply reaching the end will have you pulling your hair out on higher difficulties. Things don’t stop after you’ve completed the story though as after your first run is done, you’ll unlock a bunch of new characters to go at things again. Alternatively, you could put the freshly introduced mutators into play. 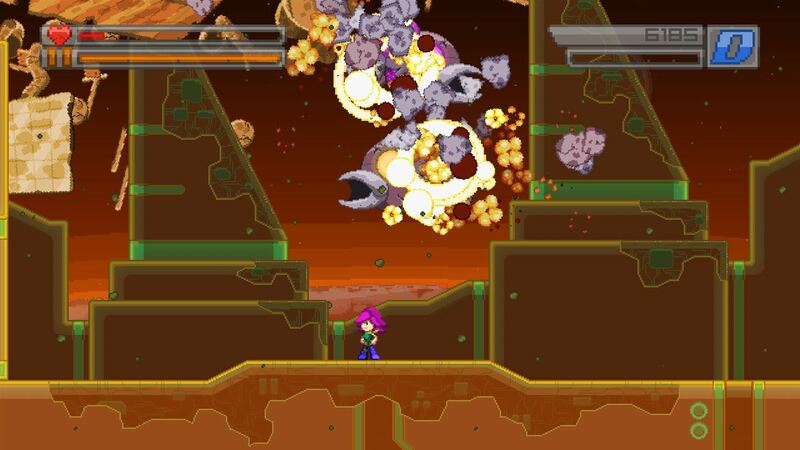 These can change things up to make BLEED 2 even harder with near impossible bosses, or easier with infinite health, as well as giving options for tiny bullets or showing enemy hit boxes amongst other things. Choosing these does take away saving and the unlocking of achievements though. As I mentioned earlier, Arcade and Challenge modes have made a return with BLEED 2. The former of these allows players to attempt to complete the game using only a single life. For me, this proved impossible, even on the easy difficulty. My skills aren’t exactly bad, but without a near inside knowledge of where every bullet is going to come from before it’s even fired, there is little chance that many will manage this one. Still, the challenge is certainly an enjoyable one, and for speed runners this could be seen as a perfect test to prove your greatness. In addition to this, we have the Challenge mode and if I’m honest, it wasn’t something I particularly enjoyed in the original. With bosses feeling like too much of a focus for the gameplay, it felt impractical to go into a game mode that pits you against three of the godly opponents when a normal 1v1 battle can prove challenging enough. In BLEED 2 however, things aren’t half as dull. No longer do the boss fights feel like the only focus and with each level working like a progressive build up to the boss, rather than being all about the main fights, it is more enjoyable jumping into what is already acknowledged as a completely unfair matchup of a 3v1 boss fight, even despite failing to come out on top. It’s an unbalanced mode for sure, but it’s a welcome inclusion and if you’re after something a little extra but aren’t wanting to go through story offering again, it’s a great option to have. By far though, the new Endless mode is a personal favourite. In here, players take on a series of randomly generated levels, making for an entirely different scenario each and every time you play. Here, you can choose your procedural seed or let the game pick a random one, and after deciding on a difficulty, players then head out into whatever it is the game decides to throw at you across five different levels. This is a great way to play BLEED 2 as there is no chance to prepare for what’s coming given the sheer randomness of each playthrough. Of course, with ranks still included and boss fights at the end of every level, extending the number of playable levels way past the initial seven available in the story, ensured this was the mode I found myself happiest to return to. If all of that sounds like a bit much for a lone hero to take on, then players with an extra controller laying around can make the most of the co-op option. Personally, I preferred playing the game solo simply because it proves difficult enough to keep track of everything without another character zipping about. But those wanting a co-op adventure will be happy to know that it’s a seamless experience that works well – provided your eyes can keep up with everything else that’s going on. BLEED 2 is a fantastic game. It’s simplistic in design and mechanics, but it does the basics really well and is a total joy to play because of it. With a hero who just wants to enjoy videogames, providing us all with something to relate to, plenty of content thanks to the new endless mode and bite sized levels to fit in alongside a multitude of difficulties and accessible controls, this is a game that is great fun to pick up and play no matter your ability or skill level. And that’s not to mention the fact that it is a fantastic sequel that builds on the early success of the original.